As always, a great source for raw data on polling is RealClearPolitics. A list of all the public polling of the Virginia Governor’s race is is on the RCP page for the race. At the start, the charting looked pretty much how we might expect it to be. Attorney General Cuccinelli was underperforming expectations in Virginia, what after Bob McDonnell showed in 2009 that a pro-life Republican could win 59-41 just one year after a statewide win for Barack Obama. 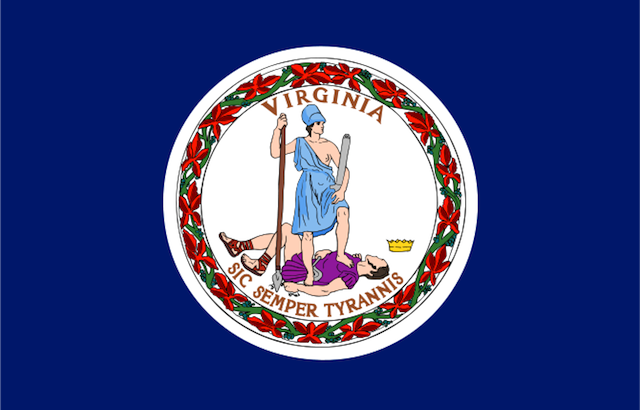 But again, that was to be expected, because the Virginia GOP was enduring a bitter spat between Cuccinelli and Lieutenant Governor Bill Bolling, who expected to be the front runner for the nomination for Governor, then dropped out of the Republican race and considered an independent run before giving up on that. But what’s important is what happens in mid-July. We see something we really shouldn’t see: a discontinuous move in the race, permanently dropping Ken Cuccinelli’s support level to a point he’s not yet recovered from. Mathematically, in a typical race, this shouldn’t be, but this is not a typical race. In July, term-limited Governor McDonnell was reported as receiving large gifts from corporations, and then touting those corporation’s products as beneficial to the commonwealth. Naturally, once the state’s top Republican was implicated in scandal, Democrats rushed to try to tie other statewide Republicans to the scandal, including Cuccinelli. This can’t help him. I’m reminded of the state of things in Ohio after Governor Taft’s Coingate scandal, where Republicans underperformed for a while. Additionally, the conservative movement in Virginia has been unhappy. This year, McDonnell passed a transportation plan, trading off conservative-friendly provisions of his overall plan in exchange for tax increases in order to win votes from Democrats and ensure passage of his signature legislation. This left many Republicans already demoralized going into the scandal. So, as much as Republicans would love to say that the polling here is unreasonable, and that there’s no way Terry McAuliffe is so surely ahead, any deviations in the electorate predicted by the polling can be perfectly explained by the year the Republican Party has faced in Virginia. By contrast, McAuliffe appears to be doing his best to capitalize on the social issues-motivated campaign Barack Obama ran in the state last year. The October 10 Quinnipiac poll suggests that McAuliffe’s strongest issues are “women’s issues” and abortion, where he heads 55-30 and 50-34 respectively over Cuccinelli. However this race isn’t over. We can see in the same poll evidence that while McAuliffe is almost certainly ahead, it’s not likely to translate into as much of a general election lead as it appears. Why? The polling is including a third party candidate who, according to Quinnipiac, is getting 8% of the overall vote, including 7% of Republicans, no Democrats, and 13% of independents.. By contrast, the independent who was last sold as a major spoiler was Russ Pots, who didn’t come close to living up to the hype and only took 2% in 2005. No third party candidate in my lifetime has outperformed Potts for Governor in Virginia, as well. For context, exit polls indicate Mitt Romney won Virginia Independents 53-43, even as Barack Obama won the state overall 51-47. So what if Libertarian Robert Sarvis (who failed to get the coveted Ron Paul endorsement from Ken Cuccinelli) actually gets the 2% we might expect him to get? Cuccinelli certainly gets almost all of the Republican Sarvis voters. So give him 2 points from that. McAuliffe probably gets a small edge among independents, assuming anti-incumbent, anti-scandal, and anti-tax sentiments, so let’s give McAuliffe 2 points and Cuccinelli 1. 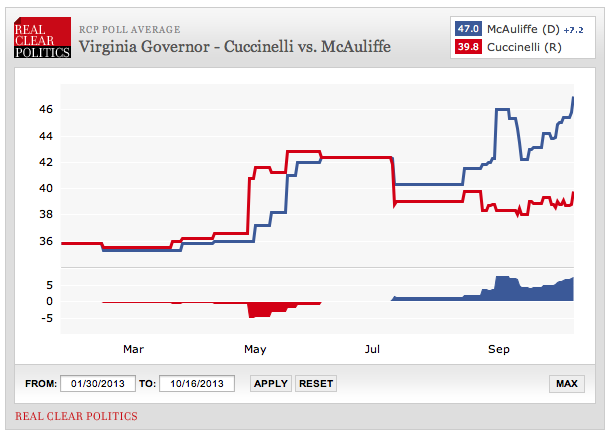 So instead of 47-39, we’re looking at McAuliffe 49, Cuccinelli 42, Sarvis 2. So using our back-of-the-envelope calculation, given a depressed Republican electorate, Cuccinelli is still behind. If he wants to win, he’s going to have to find a way to overperform in turnout the same way Steven Lonegan did in New Jersey this week, managing to pull a predicted 15 point race into a much closer 10 point one. It’s possible, but for the above mentioned reasons, this is a bad year for Republicans in the Commonwealth of Virginia.